ROCK/SKELETON BUCKET CompaCt traCk/Skid Steer LoaderS & traCtorS FEATURES • Dual ReinfoRceD-Steel Plate ManufactuRing • MaxiMuM Rollback DeSign • MaxiMuM caRRying caPacity Clear, carry, and remove rocks, stone, concrete, brush and debris with Power, Leverage and Xtreme Ease. ROCK•STONE•CONCRETE•DEBRIS SPEED EFFICIENCY ACCURACY • available in 60”, 72”, 78” anD 84” WiDthS Break-Out Force & Strength! 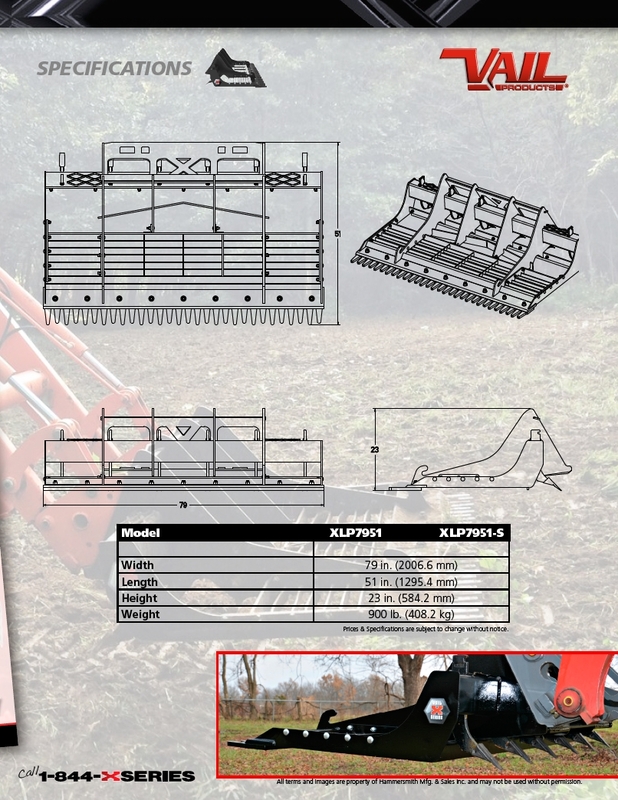 America’s Land Clearing Equipment Specialists Call • fitS all MakeS anD MoDelS VAIL PRODUCTS® VAILXSERIES.COM 1-844-XSERIES (973-7437) © Hammersmith Mfg. & Sales Inc.